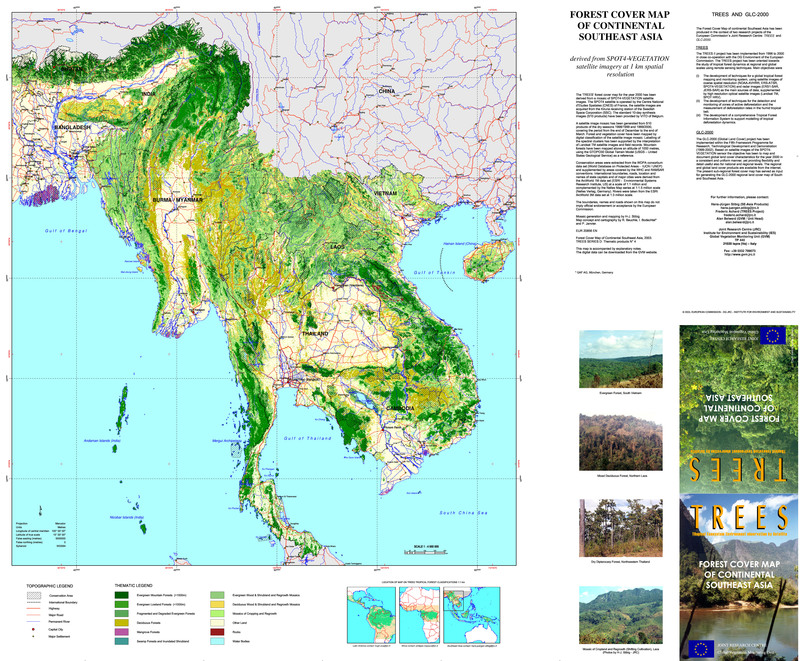 The 'Forest Cover Map of Continental Southeast Asia' covers the countries of Bangladesh, Myanmar, Thailand, Laos, Cambodia and Viet Nam, it comprises the tropical parts of northeastern India and of southern China (Yunnan & Hainan). The Himalaya mountain range (e.g. Bhutan) is included for reasons of geographical completeness. This map was produced by digital classification of a regional SPOT VEGETATION satellite image composite, generated from all acquisitions of the two dry seasons of the years 1998/1999 and 1999/2000 (December-March). The spatial resolution of the map corresponds to about one square kilometre (112º -1). The 'Forest Cover Map of Continental Southeast Asia' displays the main forest formations, including evergreen mountain forest (> 1000m elevation), evergreen lowland forest (< 1000m elevation), deciduous forests (mixed and dry deciduous forests, Dry Dipterocarp forests), mangrove forests and swamp forests (around Tonle Sap Lake). The separation between evergreen and deciduous forest types is based on the predominance of leaf shedding during the dry season, rather than on strict botanical definitions. The map provides an overview on the spatial distribution of regional forest cover. Given the coarse spatial resolution this map cannot accurately reflect the frequent local and gradual transitions in tree canopies, such as from intact to degraded or fragmented forests canopies, or from dry deciduous forests to dry deciduous wood- and shrub land. A new forest cover map of continental Southeast Asia derived from satellite imagery of coarse spatial resolution, Stibig, H-J., Achard, F. and S. Fritz, 2004. Applied Vegetation Science. 7: 153-162. Forest cover map of Continental Southeast Asia at 1:4 000 000 derived from SPOT4-VEGETATION satellite images, Stibig, H-J. and Beuchle, R. 2003, Publications of the European Communities, EUR 20856 EN, 30 pp.